We meet at Hospital Road trail head, GPS can be found HERE! Fight Club + Nationals prep = Winter Worlds. Practice will start at 10:00am Sunday January 1st. Location is Holster Park in Clifton, NJ. Coach Ken will host CX practice session, a leg-lessening skill-sharpener workout, great for any rider going to Nats or any rider just looking to get rad. Coach Kenneth Lundgren leads events, group rides, and training camps year-round. Check this Event Calendar for continuous updates. In Spring, Coach Lundgren leads endurance MTB and road rides for groups of all levels. As the weather warms into May, Lundgren leads Wednesday Worlds MTB and ROAD practices. His EE Pro Factory teammate Laura Slavin sometimes joins to power the lead group and Gabrielle Czernik, the #1 short-course triathlete in the state, helps pace the road rides and any groups that form. 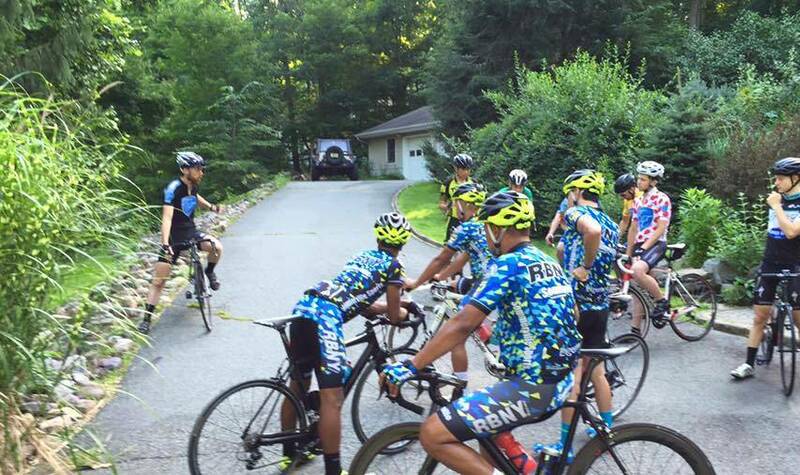 All summer, the Wednesday practices alternate between road and MTB; the two venues are the Lewis Morris EE race course and the Notorious Fast Fifty road route, which departs from Riverdale, NJ. BONUS: Strava king Michael Gisler drives and paces the fastest group on Notorious Fast Fifty rides. Fight Club in the finest form, come get it. The Breakfast Club Ride begins in May. These rides alternates between road and MTB. The road rides depart from GWB and the MTB rides from Six Mile Run — these Saturday morning rides are early and casual, fun social riding — we will pedal, too. If Wednesday is your Fight Club ride, Saturday morning is your relaxed endurance-pace-with-awesome-group ride. These rides are designed for riders of all levels and are not drop rides. The group is lead and paced by Kenneth Lundgren and a Guest Rider. The Elite Endurance TOUR is a stage-race group-ride event that tracks points for GC, sprint, climbing, and women’s competitions… This year, the TOUR will run 6/21-7/9. In 2015, Scott Sugent won the yellow jersey, Chris Santalucia grinded out the green jersey, David Schwartz won the polka-dot, and Jennifer DeFalco won the Tour de Femme jersey, for top female. Last autumn, TEAM Elite Endurance won the NJ CX Cup team award. Wednesday cyclocross practices begin late-August and the Elite Endurance two-tent race compound will set up at every NJ CX Cup race, as well as at the biggest ‘cross events in the region. The first Fast Fifty of the year, pace will be moderate endurance/tempo — all riders are welcome to attend, you are expected to maintain pace of group. This is not a Drop Ride. Wheels down 8am from Elite Endurance campus in Riverdale NJ. Please email Coach@EliteEndurance.com for directions and parking. Wheels down 6pm from Sunrise Lake. The group will do 3 laps of EE race course: first lap will be an easy warm-up, second-lap is race pace, the third lap is free riding. A perfect first day. Laps will be 32-36 minutes. Wheels down 8:15am from Six Mile Run, Canal Lot. All riders are welcome to join. Coach Lundgren will moderate a pace based on the group, no drops. Route will be full out-and-back and extra loop if group is interested. Ride time 100-140 minutes. Wheels down 6pm from the Elite Endurance campus. Fight Club starts in earnest. Terrain is fast and rolling. Come check it out! Group will sprint up Wilder KOM, then thrilling sprint point at end of Upper Saddle River paceline, final sprint at Riverdale Armory. Superior race training, 4 regroups along way, this is the Notorious Fast Fifty — welcome to the party, pal. Please email Coach@EliteEndurance.com for directions and parking. Wheels down 8am from Elite Endurance campus. We will do the Notorious Fast Fifty route at social endurance pace, all experienced riders are welcome to join. Route is flat-rolling, there are no drops on this ride. We will also preview many of the Strava points in the 2016 Elite Endurance TOUR. Post-ride, light and nutritious fare will be provided by DietRx. The first sampling at Wednesday night’s WWs was a smash with the 10+ riders in attendance. Wheels down 5pm from Elite Endurance campus. Route is flat-rolling and awesome, very scenic, a tour of the region’s lush river scene. Roads are fast, wide shoulders, excellent pavement, minimal interruptions. There are a few rollers but course is basically flat. Pace will be endurance-tempo, this is a No-Drop Ride, the first time we did it with varied group average speed was 21+. Come out Sunday and get rad. Post-ride goodery will be provided by DietRx. Wheels down 6pm from Sunrise Lake. The group will do 3 laps of EE race course: first lap will be an easy warm-up, second-lap is race pace, the third lap is free riding. Come get rad! This is our first run of the complete course during a weeknight — come get rad with us and see what Fight Club at its very finest is all about. Wheels down 6pm from Elite Endurance campus in Riverdale NJ. This is one of the fastest, safest, and best-organized group rides in the region. Wheels down 6pm from Riverdale NJ. Email Coach@EliteEndurance.com for directions and parking. Route is flat and rolling, come out Friday night for a fun social ride and then post-ride bonfire meal out back near the woods. The goodery is 100% all-natural, organic, sugar-free, and provided by DietRx’s Gabrielle Czernik, the top short-course triathlete in the state. Plan for rad night. Wheels down 6:30 from Elite Endurance campus. Contact Coach@EliteEndurance.com for directions and parking. Wheels down 5pm from Elite Endurance campus. Route is flat/undulating and beautiful, very scenic, a tour of the region’s lush river scene. Ride time is 2h or more, depending on group. Roads are fast, wide shoulders, excellent pavement, minimal interruptions. There are a few rollers but course is basically flat. Pace will be endurance-tempo, this is a No-Drop Ride, the first time we did it with varied group average speed was 21+. Wheels down 6pm from Sunrise Lake. The group will do 3 laps of EE race course; first lap will be easy warm-up, second-lap is race pace, the third lap is free riding. As the day gets longer, the group can do additional laps to maximize ride time. Wheels down 8:15am from Six Mile Run, Canal Lot. All riders are welcome to join. Coach Lundgren will moderate a pace based on the group, no drops. Route will be full out-and-back and extra loop if group is interested. Ride time 2-2.5h. Arguably the best and most exciting Gran Fondo course in NJ, this is the hometown Elite Endurance event. Email Coach@EliteEndurance.com for EE discount. Coach Lundgren is training hard to help lead Mike Gisler to peak performance in this epic GF event! Route is fast and rolling — Fight Club at its very best. Wheels down 6pm from Riverdale NJ. Contact Coach@EliteEndurance.com for directions and parking. We ran this route on 5/25/16 with zero issue — come out and throw down! Route is flat and fast, wheels down 6:30pm from Riverdale NJ. This is a no-drop ride, but you are expected to maintain the pace of the group. Come out and get rad. Coach Lundgren will pace the last group on the road. Post-ride bonfire and meal is provided, as always. Wheels down 6pm from Elite Endurance campus. Route is flat-rolling and awesome, very scenic, a tour of the region’s lush river scene. Roads are fast and armed with wide shoulders, excellent pavement, minimal interruptions. There are a few rollers but course is basically flat. Pace will be endurance-tempo, this is a No-Drop Ride, the first time we did it with varied group average speed was 21+. Very, very pleasant riding. This edition of the Breakfast Club Ride will preview many of the points segments for the upcoming Elite Endurance TOUR. All riders are welcome to join for this rad reconnaissance and tour of some of the best road riding in the region. Pace will be casual endurance, NO DROPS. Ride time will be 3h. After, Coach Lundgren will lead a second ride immediately after that will cover the Sprint route of the TOUR, which was used in the 2015 event. Will be a gnarly day. Wheels down 8am from EE campus. Please contact Coach@EliteEndurance.com for parking and directions. Wheels down 6:15pm from Riverdale NJ. Ride time is 90 minutes. Who will wear the first yellow, green, polka-dot, and red jerseys of this year’s TOUR? Awards & bonfire post-ride at EE campus. Wheels down 6:15pm from Riverdale NJ. Ride time is 2h. Route is flat-rolling, and will include the first KOM points in the TOUR up Taylortown Road. No drops on this ride, come see what the TOUR is all about. Awards and bonfire post-ride at EE campus. Wheels down 8am from Elite Endurance in Riverdale NJ. Route is rolling and will include four points sections — expect major shake-ups in GC. Ride time is 3h. Lunch at Tavern 5. Wheels down 6:15pm from Riverdale NJ. Ride time is 90 minutes. Awards and bonfire post-ride at EE campus. Wheels down 6:15pm from Riverdale NJ. Ride time is 2h. Awards and bonfire post-ride at EE campus. Wheels down 8am from Elite Endurance in Riverdale NJ. Ride time is 3h. Lunch at Tavern 5. Wheels down 6:15pm from Riverdale NJ. Ride time is 2.5h. Awards and bonfire post-ride at EE campus. Wheels down 8am from Bicycle Tech in Lincoln Park NJ. Ride time is 2.5h. Lunch and podium at Tavern 5! Stage 9 is the final stage of the 2016 Elite Endurance TOUR. Wheels down 6:15pm, main Sunrise Lake parking lot. The group will do 3 laps of EE race course; first lap will be easy warm-up, second-lap is race pace, the third lap is free riding. If daylight allows, the remaining group can hammer a fourth lap. This Saturday, Coach Kenneth Lundgren and Lupus Racing Team star cyclist Gavriel Epstein will lead an open group ride from the Radical Velo bike shop in Englewood NJ, just minutes downhill from GWB. Radical Velo address: 15 S Dean St, Englewood NJ. Wheels down 6pm from Canal Lot. Will do brisk out-and-back and then a second half-loop — will be surreal night of singletrack bliss! This is not a drop or murder ride but you are expected to maintain the pace of the group. This is first week of two at Six Mile Run for Wednesday Worlds. Wheels down 5pm from Riverdale NJ. Ride time is sub-3h. Contact Coach@EliteEndurance.com for directions. All experienced riders are welcome to ride. The Notorious Fast Fifty-Nine is lead by Coach Kenneth Lundgren. This is a no-drop ride; however, you are expected to maintain the pace of the group and not be an anchor. Terrain is flat-rolling; fast riders pull, attack the harder sections, the weaker riders sit in. If the group splits, they regroup at any stops in the road — this route always flows very well with all groups. The Notorious Fast Fifty-Five moves through Riverdale, Pompton Lakes, Pompton Plains, Pequannock, Lincoln Park, Wayne, Fairfield, Montville, Boonton, Mountain Lakes, Denville, Rockaway, Kinnelon, Butler, and Bloomingdale. The Boston Rebellion weekend is one of the biggest pro events of the year. It is the final race in the USA Cycling US Cup and also the final event in the Kenda Cup East Series. — the best racers in the country will be in attendance. www.bostonrebellion.com. Saturday is the Pro XC event. Laura Slavin, Nick Lando, and Kristine Contento-Angell will be competing against the best MTB racers in the country. Sunday is the Pro/Open Short Track event. Laura Slavin, Nick Lando, and Kristine Contento-Angell will be competing against the best MTB racers in the country. Official Fight Club begins. Show up when you can. Coach Lundgren leads pre-ride laps starting by 5:40pm. Wednesday Worlds practice session commences at 6pm and the first session will consist of skills drills, intervals, and practice laps. All interested riders are welcome to join. The group rides ’til dark. This Saturday, the Elite Endurance tent will be at Windham Mountain for full race support. Laura Slavin of the EliteEndurance.com Pro Factory Team is racing the pro cross-country event and Nick Lando of Team Town Cycle is racing the U23. The Windham Mountain MTB event is also part of the Root 66 race series and the NYS MTB Series. This week’s Wednesday Worlds will be repeat of last week: we warm up with two slow laps on the course, then do a series of skills drills, instructional drill, race heats, intervals, and we finish with Starts. This is our Wednesday Worlds, come out and get rad. All experienced riders are welcome to join. Elite Endurance will be on-hand at the region’s biggest time trial event to support athletes with trainers, warm-up and fueling advice, mechanic support, and intel about the course. At most Elite Endurance group rides, post-ride food, snacks, and goodery is provided by Gabrielle Czernik, a diet counselor and top triathlete in the state. Official Fight Club begins! Group will start with drills, intervals, then finish with two race heats. The group will ride ’til dark. Coach Kenneth Lundgren is riding practice loops on-course by 5pm and cyclocross practice begins at 6pm. Fight Club. Coach Kenneth Lundgren will lead practice laps on the course at 5pm and the practice will start at 6pm. The cyclocross session will start with skills drills, intervals, then finish with two race heats. The group will ride ’til dark and continue to burn in course with perfect practice laps. Fight Club. Coach Kenneth Lundgren will lead practice laps on the course at 5:30pm and the practice will start at 6pm. Fight Club. Coach Kenneth Lundgren leads practice laps on the course by 5:30pm and the practice starts at 6pm. The cyclocross session opens with light skills drills, easy warm-up laps, then two race heats, then speed and power intervals, then Starts. The group will ride ’til dark. Fight Club. Coach Kenneth Lundgren leads practice laps on the course by 5:00pm, a group typically forms and nicely breaks the course in for the night’s action. Wednesday Worlds cyclocross practice will begin at 5:45pm. The session opens with light skills drills, easy warm-up laps, then two race heats, then Starts. The group will ride ’til dark and maximize every morsel of daylight. Radical Velo address: 15 S Dean St, Englewood NJ. WHEELS DOWN 8am. The Emmaus cyclocross event is part of the PACX race series. The PACX courses are diverse and fun, representative of the strong bike culture in eastern PA. The course typically has a staircase, mud, off-camber, and barriers. Fight Club. Coach Kenneth Lundgren leads practice laps on the course by 5:00pm and begins to workshop parts of the course and cyclocross practice commences at 5:45pm. Elite Endurance may have race support and tents at Whirlybird CX, part of the MAC Series. TBD. Come check out one of the best races in the region! Great course, great venue, this is what cyclocross is all about! The best cyclocross race in the region! Elite Endurance and Coach Kenneth Lundgren will be on-hand to support its athletes with pre-ride laps, trainers in the shade, mechanic support, race strategy, and fuel, ensuring a successful race experience. Saturday is the NJ State Cyclocross Championships. The best cyclocross race in the region! Day 2 will see the course run backwards with a bunch of modifications. Elite Endurance and Coach Kenneth Lundgren will be on-hand to support its athletes with pre-ride laps, trainers in the shade, mechanic support, race strategy, and fuel, ensuring a successful race experience. Lupus Racing Team cyclist Gavriel Epstein and coach Kenneth Lundgren will lead MTB rides from Englewood, wheels down 6:30pm, Radical Velo. These brisk night rides will continue through winter. The ride is for intermediate+ skill-level, average pace is 8-10 mph. The route starts with loose 25min spin to trailhead, then 45min north through singletrack and then 45min back, finishing with light paceline back to shop. Ride time is just over 2h. Riders can also meet @ End of Anderson trailhead in Closter @ 7pm. Two lights are recommended. This trail network offers some of the best trails in the region. If you have any questions, please email Coach@EliteEndurance.com. Come out and burn off more holiday calories than you would waiting in line for a Black Friday deal on a TV at Walmart. Kenneth Lundgren of Elite Endurance Training Systems will be leading a social ride from the GWB. Ride time is 2.5 hr. Wheels down 9am!